With the oceans warming and coral reefs suffering under the new environmental conditions, a group of Sandpoint students are prepared to do something about it. A before and after photo of a coral reef that has recently died. Photo by The Ocean Agency. Students of Sandpoint High School teacher John Hastings plan to travel to the Dominican Republic, where they will work hands on to fight the phenomenon of coral bleaching. An upcoming documentary screening at the Panida Theater, “Chasing Coral,” powerfully illustrates the threat to coral populations and will also raise money to help cover the costs of the students’ trip. The movie screens 7 p.m. Friday, April 19, at the Panida Theater, with donations for entry accepted at the door. 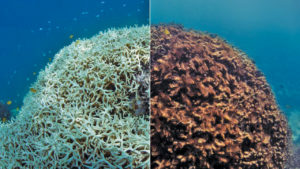 A widespread blight on coral reefs around the world, bleaching occurs when coral polyps lose the algae that provides their brilliant color and most of their energy. The coral takes on a ghostly white appearance and usually starves. The good news is people are taking action to reverse the process of coral bleaching, and that will soon include Sandpoint’s own student population. According to the trip itinerary, students will fly to the Dominican Republic and connect up with a service project. They will then learn about the biology of coral and practice the snorkeling techniques needed to assist in their preservation. Of course, they’ll also have the opportunity to squeeze in some sight-seeing and recreation in between the long days assisting coral recovery. Not only will the trip be an unforgettable experience, it could also provide the basis for three college credits if students apply for it. A donation at the “Chasing Coral” screening will go a long way to helping the students on their way, but it’s also a beautifully-shot and compelling documentary about the ecosystems most affected by climate change: the world’s oceans. A film that took three and a half years to make, “Chasing Coral” is edited together from 500 hours of underwater footage collected from more than 30 countries. The documentary covers an effort to record the first-ever time-lapse footage of coral bleaching.